Merhej’s mother is an Austrian woman who fell in love with a Lebanese man, Merhej’s father. Samandal published an early excerpt, which you can read online. Gabrieli recently gave an interview (L’intervista alla traduttrice) with the Italian Arabook, which the magazine’s Maria Laura Romani translated from Italian to English. First of all, what’s the story of your publishing house? Simona Gabrieli: The publishing house started with an associative experience: The association “Alifbata” was born in 2012 to promote intercultural exchange. We worked on pedagogical exchange across the Mediterranean, with the aim of offering “another knowledge” of the Arab world beyond stereotypes. Our aim was to show the complexity of Arab countries and, through this, we have created the publishing project. Where did you get the idea to translate “Murabba wa laban”? Simona: We believe that translation is a bridge that makes it possible to approach the big world of Arab production written in Arabic. We are planning to create a collection of comics translated from Arabic into French, publishing at least two every year. We would like to give the possibility to be translated to those who are not so well known by French audiences. That’s why the comic form is very interesting: It concerns graphic as well as textual aspects. The graphic aspect can attract a reader who is not only interested in Arabic literature. That’s why we have decided to translate Murabba wa laban. Murabba wa laban has a very complex structure. What have been the main difficulties translating it? Simona: In general, the main problem is related to verb tenses, because the Arabic language has fewer compared to French. In French, it was necessary to have a temporal coherence. Another challenge was translating the great simplicity of Lena’s language with the more tragic moments of the comic (for example the Second World War, as experienced by her mother, or the Lebanese Civil War). We have tried to translate everything in a very simple and smooth language. Did you choose to explain the cultural aspects involved in the comic, for example the title Murabba wa laban? Simona: This aspect has required a lot of discussion. 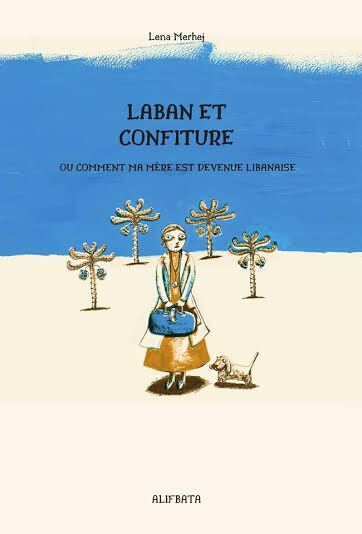 About the title itself we have choosen to translate it as Laban et confiture, ou comment ma mère et devenue libanaise to stress the cultural duality, sweet and sour, which exists in the story. Lena herself, writing the graphic novel, has chosen to leave an ambiguity until a specific point of the story where she explains this “murabba wa laban”: We have tried to keep all this. We are still wondering about whether it’s necessary to add a glossary where we explain all the cultural references, the historical facts, and the names of the places which are important for the comprehension of the text and which could not be understood by the French audience. We would like to avoid notes but we have decided to leave some explicit references which can contextualize the events. What about the graphic choices? Simona: From the graphic point of view, we kept the original Arabic graphics as much as possible, but the translation was often longer in French than in Arabic. We needed a graphic solution with the author herself. I have really enjoyed the cooperation with Lena in this project, and she has modified some images to make them suitable to the text. Another point was the puntuaction: This is more a graphic novel than a classic comic, and the text is absolutely complementary to the images and dialogues. Hence we have distinguished between the story and the dialogues: The text has been treated as a novel and we have preferred to use commas. From the graphic point of view, we have distinguished the narrative levels using different typographic methods between text and dialogues. What sort of response do you expect from French audiences? Simona: This will be a real discovery, an adventure. We have plenty of Arab comics in France, but most of them are written in French. Chatting with French librarians, I discovered a big interest in Arab comics coming from the French audience. The main feature in this project is that we translate directly from Arabic. In the past, the publishing house L’Association has published Beirut juillet-aout by Mazen Kerbaj and the author himself has translated the strips. But there has never been a translation [of a full graphic novel] from Arabic and this is why the answer is a real question mark: we will see how the French audience will respond to this publication. Thanks for sharing–currently, the links to the Arabic & English excerpts of the comic from Samandal all lead to this url (http://loantoday.sg/), is there a way to fix that?